There are groups who protest against seal killing, mainly on the grounds that it is inhumane (e.g. Sea Shepherd Conservation Society, International Fund for Animal Welfare). While I agree with their arguments, the lines of reasoning seemingly can be too easily discounted by cold, “objective” science. Therefore, my focus in this paper is to try to add to the credible scientific arguments against killing seals. 1. They are eating too many fish, especially cod. 2. They are damaging the cod stock by spreading cod worms. While the first charge is considered to be more serious, the common knowledge that seals also spread cod worm (and cod are becoming increasingly “wormy”) adds to their negative public image and contributes to public acceptance of the “necessity” of killing them. It is argued here that both charges against the seals are unsubstantiated, and evidence suggests that the truth may be quite the reverse. Extremely poor physical condition in Atlantic cod today presents a problem that should be helped by an increase, rather than a decrease, in natural predation. Also, “spreading cod worms” appears to enhance zooplankton production, and thereby also works to the ultimate benefit of cod and other marine species. Charge #1. Seals are eating too many fish, specifically cod in Atlantic Canada. It seems intuitive to many of us that low numbers of our preferred fish might be because seals are eating “too many” of them. This, however, has been very difficult to prove scientifically (Bonner, 1990). What effect does seal predation really have on the cod stock? One argument that has been offered is the observation that some of the fish eaten by seals would grow to be cod-consumers themselves, and that seals thereby spare the cod stock some degree of fish-predation that would naturally occur in the absence of seals. Interrelationships in the marine food web are so complex, that it becomes impossible to predict the effect on one species of changing the population of another (for example, see IFAW’s “simplified food web”). But a stronger case can be made. A more direct way in which seal predation benefits cod, is by allowing better nutrition and growth in the surviving fish, after selectively thinning their numbers. It is an important observation that seal predation naturally enhances fish growth and health. Cod growth rates in Atlantic Canada are now at historic lows. Recognition of the reality that cod stocks in Atlantic Canada are now showing unmistakable signs of starvation, leads to the conclusion that “overpredation” by seals cannot be occurring. If it were, the remaining cod would be fatter. According to Bonner (1990), only a single case is known in which seal predation caused depletion of a fish population, and in that instance “The fish population showed all the signs of sustained severe depletion, i.e… fast growth rate…” (Bonner, 1990) In contrast, Atlantic cod (and other ground fish) have experienced dramatic slowing of growth rates and decline in body “condition” in recent decades…strongly suggesting population control by starvation rather than predation. 1. The fact that there are more seals living in our coastal waters now than there were a few decades ago, does not in itself lead to the conclusion that total natural predation pressure on immature cod has increased. This is because other predators that also consumed young cod are no longer physically in the picture, including large numbers of mature cod, halibut, and other fish that once grew large enough to catch the same small cod that seals eat. To conclude that natural predation on small cod has increased overall, it would first be necessary to quantify the extent to which small cod predation has decreased due to the generalized relative absence of large fish in the ocean today. This has not been done. Large Atlantic cod, caught off SW Nova Scotia in the late 1980's. Cod like this one, with a jaw span nearly as wide as a man's head, do not represent "prey" to seals, but rather "competition," since they also consume small fish...including small cod. 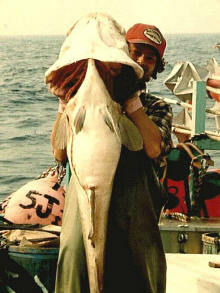 Once widespread, cod of this size are now extremely rare. Photo (click to enlarge) courtesy of Derek Jones, director of the Canadian Ocean Habitat Protection Society. A person with no understanding of population dynamics might get the impression on reading this that the grey seals are eating a dangerously high fraction of the total cod population, and in fact that they might easily consume all of the fish within the next few years. But a direct comparison of these numbers is meaningless because the consumption by seals is an annual total, while the biomass estimate is a simple snapshot of the standing stock of cod at a given time. When considering the impact of a particular biomass removal route on an annual basis (such as seal consumption), at the very least this needs to be compared to the total biomass that is annually added to the stock (through production of juveniles and growth of individuals). The addition and subtraction of “cod biomass” at the younger ages normally occurs at a much greater rate than at the older ages. And the tonnage that flows in and out of the youngest portion of the cod stock on an annual basis is undoubtedly far greater than any single, static “biomass estimate.” Young cod, especially the very youngest, are normally fast growing but short lived, transient members of the stock. Biomass gains and losses happen quickly, and this is normal. The removal of a given tonnage of juveniles simply does not have the same implication for the population as the removal of a similar tonnage of mature adults. This is another unfair bias in the common comparisons of seal consumption to fishery removals. Charge #2. Seals are damaging cod stocks by spreading the “cod worm” (Pseudoterranova decipiens, also sometimes called the “sealworm”). - In the cod, the larvae encyst in the muscles, where they remain dormant until the fish is eaten by the final host, the seal. This does not appear to place any great stress on the cod. In the warm stomach of the seal the larvae emerge from the cysts, finally mature and produce eggs. This scenario, of vast numbers of invertebrate eggs being regularly released into the ocean by seals…is this essentially a positive or a negative thing? 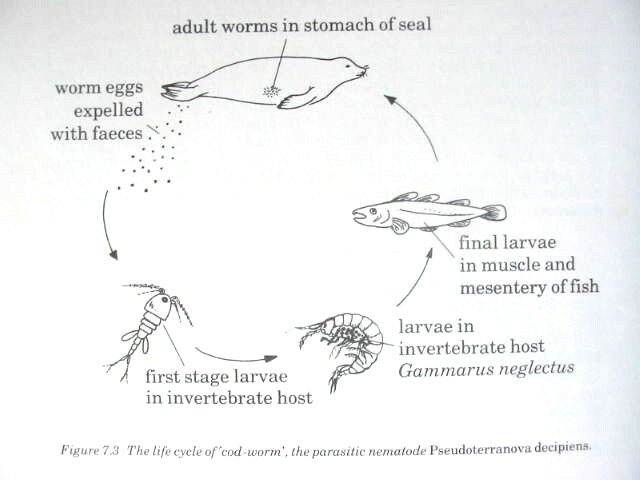 In the stable, warm, nutrient-rich environment of the seal’s stomach, the reproductive output of the cod worm may well be far higher than that of similar non-parasitic worms. Exempt from the common requirements of searching for food and defending oneself against predation, this organism seems to have little to do besides produce eggs. The marine worm species that have evolved to take advantage of the guts of marine mammals may therefore play a greater ecological role than others in the replenishment of the zooplankton by spawn production. Elsewhere I have argued that all spawn-producing marine species, fish and invertebrates, contribute to zooplankton maintenance in this way, because their pelagic eggs and larvae ARE zooplankton, and they also provide food for major zooplankton species such as copepods. The vast majority of the eggs produced are consumed as food by these tiny organisms. In this way, all these spawn producers contribute to the enhancement of marine production. It now becomes evident that marine mammals such as seals also perform this ecological service, making direct contributions to zooplankton maintenance by hosting marine worms and shedding their live spawn into the water. In today’s precarious situation of declining abundance of marine zooplankton, this steady output of worm eggs may represent an especially valuable ecological contribution. How well does the seal heed Charlie Labrador’s advice? Seals do “harvest” resources from the sea. They live by consuming a variety of marine fish and invertebrates. Size of prey seems most significant. Most codfish consumed, for instance, are small, 20-30 cm in length, and 1-3 years old. How do seals “put back” resources to replace what they have removed? It can be argued that seals completely repay the ecosystem debt that they incur by eating fish (…and even that they may repay this debt with interest). - Seals excrete urine intermittently into the water, directly fertilizing phytoplankton growth (“primary production"). - Seals excrete nutrient-rich feces, which are consumed by benthic invertebrates, many of whom produce millions of excess pelagic spawn which enrich the zooplankton (“secondary production“). - Seals excrete large numbers of live worm eggs into the water, directly enhancing zooplankton production. - Seals (and other natural predators) cull fish stocks in a way that enhances fish health, by selectively removing the weakest individuals, and reducing fish numbers, thereby lessening the competition for food experienced by the fish. - Natural death of seals results in the entire body being recycled as it is consumed by living marine organisms. The natural life cycle of a seal therefore effectively “removes” nothing from the ocean, while the fact of its existence acts to actively sustain and enhance marine production. The contrasts with the ecosystem effects of human fishing become obvious. Millions of years ago a workable balance was established between seals, fish, worms, zooplankton, etc., and it is folly for us to think that we can “sustainably manage” fish production better than they can. - “Size refuge”: If adequately fed, some cod will grow too large to be vulnerable to seal and other natural predation. These large spawning fish are major contributors to maintaining their own species, and to enhancing zooplankton stability. - If seals do ‘overeat,’ fish will grow more quickly as a result, attaining the “size refuge” (and ability to avoid predation) more quickly. Therefore, if seals eat too many cod, they will find cod becoming harder to catch. To the dismay of human fish consumers, the worm infestation in Atlantic cod is increasing. What does this mean? Does it mean that seals are causing a problem for cod? Not likely, although a rise in the size of the worm population, along with the seal population, is probably implied. Another factor favoring the successful completion of the worm’s life cycle is the fact that small prey-fish for cod are now scarce, which forces adult cod to rely more heavily on potentially worm-harboring benthic invertebrates. The more that a cod relies on these invertebrates, the more worms it will inevitably ingest. Therefore, the lowering of ecosystem productivity in itself seems to enhance the production of cod worms…which seem likely to be especially efficient spawn/zooplankton producing organisms…a turn of events which can be seen to function as a systemic compensatory response. Subtle, stabilizing feedback loops, such as this one, seem certain to have been built into the marine ecosystem. (This is “Gaia’s” way…) For another example: declining zooplankton abundance will result in a greater fraction of phytoplankton ultimately sinking to the bottom, which then stimulates increased growth of benthic phytoplankton consumers, such as scallops, which are particularly prolific/efficient spawn producers (i.e. zooplankton rebuilders), in comparison to fish, for instance. Under a lowered marine productivity regime, such as we see today, the ocean naturally tends to divert relatively more production into these more efficient benthic ‘zooplankton producers’ and less into fish. This trend is reflected in recent marine fishery changes in many areas - for example, Georges Bank now produces far fewer fish than it did in the past, but scallop growth there is accelerating. Such multi-species stabilizing feedback mechanisms have undoubtedly contributed to the long-term success of the current marine species assemblage. The zooplankton growth facilitated by one warm-blooded seal excreting worm spawn…this is not a lot when you consider the size of the ocean and the dimensions of the problem, and this one pathway doesn’t offer much hope for the “rebuilding” of the zooplankton stocks (which needs to be considered more urgently than that of the fish stocks). However, the marine production required to support one seal is not large either. My hunch (supported by the evidence of millions of years of coexistence with healthy cod stocks) is that the give and take done by the seal is nicely balanced…and that if there is any “net” effect on the ecosystem from it’s having existed, that the effect of the seal is a positive one. The zooplankton growth facilitated by one live seal, although small, remains a step in the right direction. Fishery managers need to wake up to the concept of ‘zooplankton conservaton and protection,’ an idea which may help them to appreciate the natural roles of mature fish, seals, etc., in the maintenance of all marine life. The prudent decision, or to use today’s jargon, “the precautionary approach,” must now be to leave the seals alone, along with the fish and the other surviving marine organisms. Marine ecosystem productivity is dropping, this is very serious, and we do not yet appreciate all of the ways in which the ancient interdependent marine species naturally support one another. We just need to trust that they do…and be thankful that seals still survive. “What is man without beasts? If all the beasts were gone, man would die from a great loneliness of spirit. For whatever happens to the beasts, soon happens to man. All things are connected...Whatever befalls the earth befalls the sons of the earth. Man did not weave the web of life: he is merely a strand in it. Whatever he does to the web, he does to himself." Abandoned, starving, newborn harbour seal pup, Nova Scotia, summer 2002.
tried unsuccessfully to nurture this baby...but at least they tried. Bonner, W. Nigel. 1990. The Natural History of Seals. Facts on File, Oxford. “Fish Eggs - the Perfect Food?” and references therein regarding broad trends in zooplankton. “The Downturn of the Atlantic Cod” and references regarding evidence of starvation in cod. “The Barnacle Zone” for concrete physical evidence of the long-term decline in marine productivity.